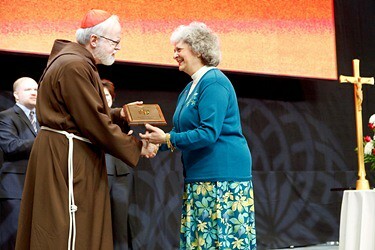 Catholic women of the year | We love it don't we…? We love it don't we…? I see the ‘Catholic women of the year’ have just been awarded. Must be one of the great non-events of the year. Remind me of the time that I happened to have a meeting in a London hotel when these same awards were being presented. Waiting in the reception area I was approached by a woman in a large brimming hat with a ‘plum in the mouth’ (as my Mum used to say) who asked me if I was ‘a Catholic woman waiting for an award’. Well I didn’t know what to say other than to ask what I had to do to qualify. She launched into an account of all the worthy activities that contenders had made which made me think that I would never qualify as long as I lived. They look for the “unsung heroines” who care for the sick or marginalised, visit prisoners, run errands in the parish, teach children the Faith, help those seeking to enter the Church, support priests and seminarians, raise funds for charity, or do any of the 101 things that brings the presence of Christ into the community and build up the Church. I know lots of women like this and my own pathetic efforts to be ‘a good Catholic woman’ pale into significance. In mid-conversation there was a flurry of movement at the door and in walked a woman I recognised as Ann Widdecombe. The voice confirmed it couldn’t have been anyone else. Shrill and loud, she wasn’t trying to be humble. Dressed as a giant bee in yellow and black stripes, also with a wide brimmed hat, she was the presenter of the awards. What a cheek I thought. She’s only been a Catholic for a few weeks … Is she the best that they can come up with? Then my client arrived and asked me what was going on. Not inclined to explain and cowardly, I suppose, I said ‘Oh it’s a woman’s award lunch’ and we moved on to talk about other things. This entry was posted in All, I was thinking... by Catherine Brady. Bookmark the permalink.